We've been getting absolutely pounded with rain around here. It pretty much poured all weekend and at night a frenzied wind whipped through the trees. My peaceful little creek has turned in to a raging river. I watched it most of the day yesterday as I sat by the window and knit a little pink hat for my niece, who is due in June. The hat is my March project for the New Techniques Knit-Along. 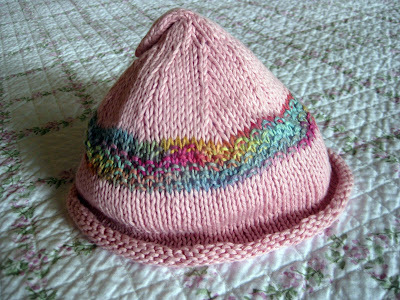 It is the first hat that I knit completely in the round using circular needles and double-points. Everything went well until I had to switch to the DPNs ... I really struggle with those. The hat has all sorts of holes and other mistakes at the top, mainly on the side that you can't see. I really don't like how the hat turned out. It reminds me of the holey, uneven scarves I made when I was first learning to knit. But I keep reminding myself I'm just learning to use the DPNs and practice makes perfect. This is what I have to say about that pink baby hat...ADORABLE! I truly love it. Can't wait to see a photo of it on your sweet niece. Wow...not long now! Lots of rain...yes...here too in SF. I actually think the hat looks gorgeous. DPN's are so hard to get used to. I knit my first hat soley on DPN's because I was afraid to switch from circular to DPN's midway. You will have the most well-adorned niece in town! I LOVE the little pink hat. I think you should have modeled it for us haha. And HUSH about the mistakes. As my mother would say, "A blind man would be glad to see them." The hat looks great. As you know, I like dpns for socks! You will get used to them. Or you could always switch to the magic loop. I really like that as well. I think your hat is great and your niece is going to be 'fabulous' wearing it. I wish we had rain here. It has been very dry and I am already hearing the dreaded :drought: word. I once again started over for my March project. I really don't like the yarn I am using! The hat looks so lovely. DPNs can be quite fiddly. Did you use wooden ones? That helps a bit. You could also use two circs. But it all takes practice and you will get the hang of it! Love that little hat:) I think it is perfect! Have a blessed day, hope the rain lets up for you! HUGS! I love that hat, I like the colours!! It will be loved... holes and all. I think the hat looks great! It was an awful rainy, windy weekend here too! I want sunshine!!! The hat is so cute! I'm sure the next time you use dpns it will be easier. Well, it sure looks adorable from here. And just think of it as more sock practice! Ok, I know how frustrating it is...but, but, but, that hat is adorable, the color, the shape, the stripe...I love it! 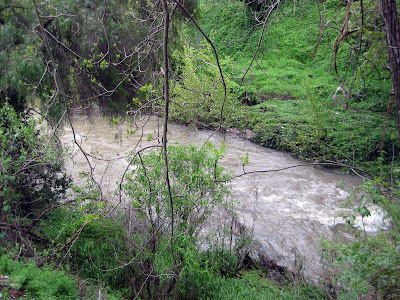 With the huge rain storm today, that little stream is going to be a huge rushing river! Stay warm and cozy and safe. I missed your post...good thing you left me a comment!!! I'm such a dizzy old lady! I think the hat is sweet! Have you heard the theme for April ATC! ?